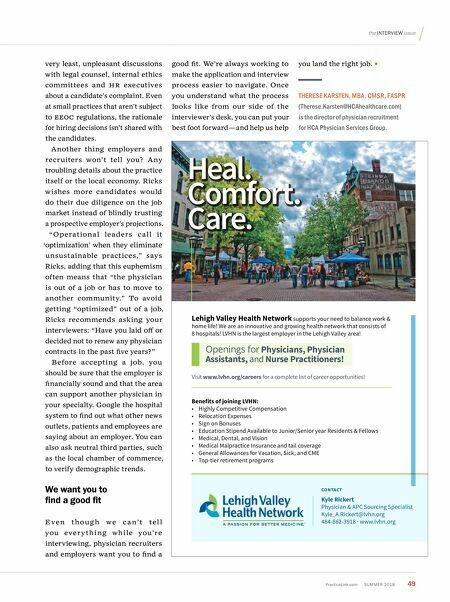 PracticeLink.com S UMMER 2018 49 the I nterv I ew issue Lehigh Valley Health Network supports your need to balance work & home life! We are an innovative and growing health network that consists of 8 hospitals! LVHN is the largest employer in the Lehigh Valley area! Openings for Physicians, Physician Assistants, and Nurse Practitioners! 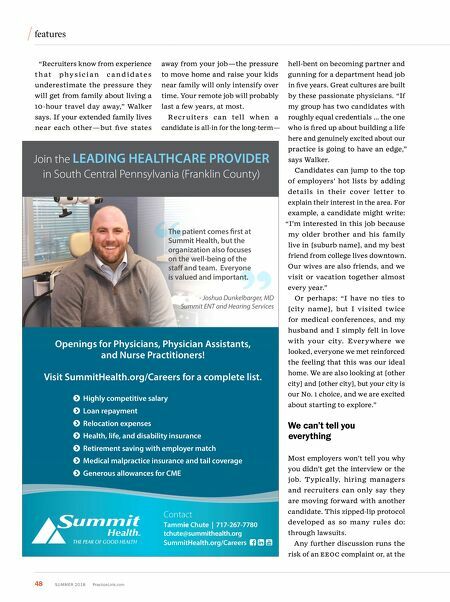 Visit www.lvhn.org/careers for a complete list of career opportunities! Benefits of joining LVHN: • Highly Competitive Compensation • Relocation Expenses • Sign on Bonuses • Education Stipend Available to Junior/Senior year Residents & Fellows • Medical, Dental, and Vision • Medical Malpractice Insurance and tail coverage • General Allowances for Vacation, Sick, and CME • Top-tier retirement programs CONTACT Kyle Rickert Physician & APC Sourcing Specialist Kyle_A.Rickert@lvhn.org 484-862-3918 · www.lvhn.org Heal. Comfort. Care. very least, unpleasant discussions with legal counsel, internal ethics committees and h R executives about a candidate's complaint. Even at small practices that aren't subject to eeo C regulations, the rationale for hiring decisions isn't shared with the candidates. Another thing employers and recruiters won't tell you? A ny troubling details about the practice itself or the local economy. Ricks wishes more candidates would do their due diligence on the job market instead of blindly trusting a prospective employer's projections. "O perationa l leaders ca l l it 'optimization' when they eliminate unsustainable practices," says Ricks, adding that this euphemism often means that "the physician is out of a job or has to move to another community." To avoid getting "optimized" out of a job, Ricks recommends asking your interviewers: "Have you laid off or decided not to renew any physician contracts in the past five years?" Before accepting a job, you should be sure that the employer is financially sound and that the area can support another physician in your specialty. Google the hospital system to find out what other news outlets, patients and employees are saying about an employer. You can also ask neutral third parties, such as the local chamber of commerce, to verify demographic trends. We want you to find a good fit E v e n t h o u g h w e c a n' t t e l l you ever y t h i ng wh i le you're interviewing, physician recruiters and employers want you to find a good fit. We're always working to make the application and interview process easier to navigate. Once you understand what the process looks like from our side of the interviewer's desk, you can put your best foot forward — and help us help you land the right job. THERESE K ARSTEN, MBA, CMSR, FASPR ( Therese.Karsten@HCAhealthcare.com) is the director of physician recruitment for HCA Physician Ser vices Group.